It was 2016. On stage was SS Rajamouli, creator of the blockbuster fantasy epic about a superhero with billowing hair, dead eyes, hunky physique but still vulnerable to royal intrigue. Next to him was MS Dhoni, someone who was living out that very dream. It was easy to guess who was in awe of the other. That day, the Baahubali creator-director with a cult following played the unapologetic fan at the music launch of the still-to-be released biopic, MS Dhoni — An Untold Story. Not quite the master-meets-the-muse moment, this was the case of a vivid storyteller coming face-to-face with the embodiment of his outlandish imagination. After all what was the colossal Indian cricket ecosystem, if not the endless rank and file of padded-up foot soldiers braving swishing swords, stampeding elephants, sly cannonball strikes, marshalled by conspiring men huddled in palatial surroundings? Drop those computer-generated exaggerations and the kingdom of Baahubali and Planet Cricket can pass off as twin universes. At their deep core, the stories of the medieval mountain-climbing warrior Mahendra Baahubali and the conqueror of several peaks, the pahadi-from-plains Kshatriya, Mahendra Singh Dhoni, aren’t too different. YouTube archives that Dhoni movie promo at Hyderabad, where standing a fair distance away from Dhoni on stage, the modest-to-a-fault Rajamouli begins in Telugu. That itself triggers frenzy in the jam-packed hall. The wolf whistles are deafening, the star power on stage blinding. The director stammers, his train of thoughts derailing. “This is so emotion-filled that it is difficult to talk, sir, but still I will try, sir,” says James Cameroon’s Indian avatar, addressing Dhoni, who is wearing the awkward smile of the embarrassed. The crowd gets the drift, they know the hierarchy — the maestro has conveyed that he is playing second fiddle today. The famous “Dhoni, Dhoni” chant starts like an infectious murmur, ever so slowly rolling forward from the back row. Rajamouli switches to become the cheerleader. “Dhoni, Dhoni, Dhoni…” He could well have been on one of his movie sets, co-ordinating the extras for a grand coronation scene with the chorus of “Baahubali, Baahubali” rising. It’s a memorable frame of two men who wear their epoch-making achievements lightly. One born in Chhattisgarh’s Raipur, the other in Karnataka’s Raichur — two outliers who took on Mumbai, spectacularly calling out the city’s historic boast of being best at both cricket and entertainment. A text to Rajamouli requesting him to talk about his Dhoni fascination goes unanswered. His secretary calls to say that “Sir is sorry”, that “he’s too busy in production talks with foreign delegates.” Persistence pays. “Sir” responds to a query about whether Dhoni was the inspiration behind him calling his protagonist Mahendra. Rajamouli is the kind who believes in sticking to facts even if it means spoiling a good story. “No,” says his text, with a smiley. All’s not lost. Question two about the possible parallels between the two Mahendras, compels the director to open up. He says that his opus does have a Dhoni-like character, but it’s not Mahendra. 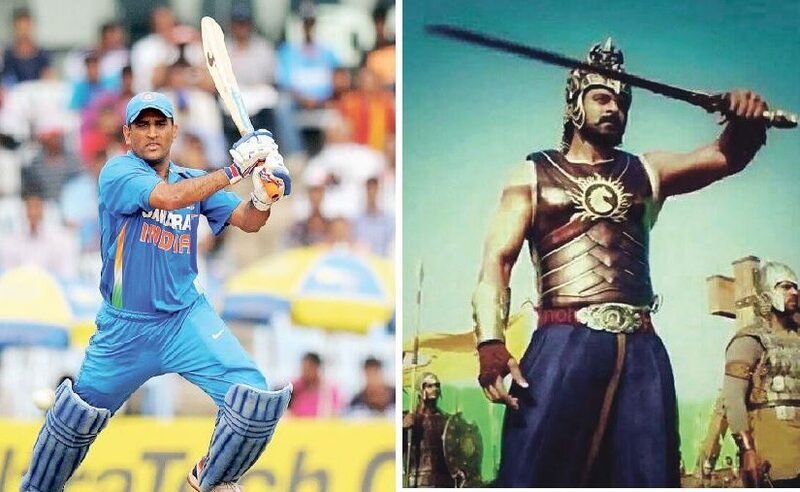 “Mahendra Baahubali was impulsive, Dhoni is composed. I would draw a likely comparison with Amarendra Baahubali, in fact,” he said. In the one line, Rajamouli has unravelled Dhoni. It’s the observation of a seasoned reader of present-day cricketing trends, and an astute writer, known to painstakingly craft his complex characters. For those back from their long trip to Mars, Amarendra is Mahendra’s father — actor Prabhas with his Dhoni-meets-Conan looks playing both the roles. After complex twists and turns, Amarendra loses his crown but not his popularity. In a memorable coronation scene, the guards applaud Amarendra’s relegation to army commander more vigorously than the cheer they extend to the new king. They thump the ground with their spears, shaking the throne. Some men don’t need titles to be a leader of men. Of late, that’s how those in the stands, and also on the central square, feel about former captain Dhoni when India is fielding. He is India’s de facto captain for crisis situations, a half-skipper who has Virat Kohli’s full support. It’s a convenient leadership arrangement, a never-seen-before unofficial delegation of responsibility. This new-found bonhomie between the present and the incumbent leader has its share of theories, not all conspiratorial, so used to turf wars and ego fights are those who are in the know of the power dynamics in the dressing room. They say Dhoni getting the power of attorney when Kohli is in need of counsel or too drained to think, possibly after a stunning hundred, is a calculated Game-of-Thrones move. Dhoni, 37, two-thirds retired from international cricket, is well and truly living the margdarshak phase of his innings and is no threat to the team’s supreme leader. The ageing Dhoni, with a “more salt, less pepper” beard, isn’t quite a CEO aspirant; he is a trusted old hand managing the help desk. During India’s recent 1-4 loss to England, Mike Brearly, former skipper and one of world cricket’s great thinkers, expressed fears about Kohli turning into an authoritarian leader who might get alienated from his team mates. The BCCI commentators, between their stints on air and typing enthusiastic Kohli praise on Twitter, often walk across to the press box to speak their minds about the Indian captain’s limitations as a strategist. With such talk rife, for Kohli to seek out Rohit Sharma, the long-time stand-in skipper, for consultations between overs would be bad optics. It can give the selectors ideas. But with Dhoni stepping in to play the ringmaster during the final act, the captain has the luxury of fielding on the fence, fully assured that the team is in safe hands and his throne is secure. It’s in this context, that the talk of Dhoni not lasting till next year’s World Cup fails the all-important reality check, despite a strong cricketing logic that supports his ouster. Team India can perhaps do without Dhoni but Kohli certainly can’t. That ends the debate. Remember this is the same BCCI that sacked a highly successful coach, Anil Kumble, since it didn’t want to confront captain Kohli. So close to the World Cup, it wouldn’t want to disturb the Kohli-Dhoni arrangement. On the flipside, this will also mean that Dhoni has the liberty to be himself — a natural-born leader. Long ago, a director had approached actor Rishi Kapoor to play a famished have-not. 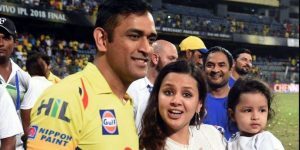 The story goes that the chubby actor from Bollywood’s first family had looked puzzled and asked the filmmaker, “From which angle do you think I look poor?” Likewise, Dhoni, with his self-assured persona and aura of authority, doesn’t look like a “follower” from any angle. Some people just don’t have it in them to be minions. Very early in life, Dhoni had the premonition that he was too special to be stuck in Ranchi and end up as a local legend. Later in life, he found the idea of being buttonholed as a ticket collector, at the mercy of the higher-ups in Railways for every perk and promotion, too stifling. Dhoni eyed bigger goals and assigned himself larger roles. Even during his early days in the Indian team, he was conscious of the team’s collective interest. There was no field responsibility that he thought was beyond his position or pay scale. In a brutal analysis of the Indian psyche, Greg Chappell, in his book, Fierce Focus (2011), singles out Dhoni for unqualified praise. “The real ray of hope for Indian cricket was Mahendra Singh Dhoni, one of the most impressive young cricketers I’d ever worked with. He was smart, and able to read the game as perceptively as the best leaders. During breaks, if I wanted to know what was going on in the middle, Dhoni became my go-to man,” he writes. be checking Aadhaar cards for passenger identification on Rajdhanis or Shatabdis. The Ranchi boy took his own calls. The Mahi way was seeped in individualism and non-conformity. Dhoni’s rise to the India ranks coincided with the period when small-town India was getting entrenched into the national team. The Mumbai-Delhi-Bengaluru-Chennai monopoly had faded long ago but still a distinct class divide existed, both in the dressing room and also in the mind of fans. The urban and English-speaking players — Tendulkar, Rahul Dravid, Ganguly, Kumble — were still seen as leaders. They were hailed as the men with refined cricketing skills and sharp intellect to strategise. The likes of Dhoni, Sehwag, Harbhajan Singh, Munaf Patel were expected to be the soldiers who followed instructions. In his early days, Dhoni, like Virender Sehwag, was painted as the milk-guzzling cricketer with the strength of a pehelwan and the stamina of a farmer. At other times, thanks to his shoulder-length blonde-streaked mane, he was compared to a daredevil Tarzan who swung wildly between the stumps. To be called one of the Beatles, you need to be on the right side of the divide — the urban elite. The adjectives used for small-towners, too, were unsophisticated. Dhoni was never clever, he was cunning; he never caressed the ball, he always hammered; he didn’t glide between the wickets, he scampered. With time, opinions changed. The Tarzan became a monk, and it wasn’t an overnight makeover brought about by some old-school barber. It took years to brush off the bias of the billions. Redefining India’s limited overs cricket, Dhoni kept handholding the team through minefields with the poise of a seasoned hostage negotiator; calm began to spread around the country’s historically edgy cricket fandom. The mass fan following via satellite was a dream straight out of the head of a tele-evangelist. For the first time since cricket got cabled into homes and ODIs overtook Tests, Dhoni ensured that India was relaxed on match days. The avid cricket-watchers of the ’80s and ’90s, as Rajamouli confessed, will tell you that the good old days weren’t that good. Those Friday games against Pakistan, the World Cup semi-final against Sri Lanka in 1996, countless batting collapses against Australia when chasing, endless abject surrenders once the asking rate touched six, the Javagal Srinath run-outs — it was an era when you never batted second and Tendulkar’s early departure was a signal to call friends over for a collective catharsis over a game of gully cricket. With Dhoni around, India could dare to chase. As a viewer, one wanted, rather longed for, the “Dhoni vs bowler” final-over duel. What was once traumatic was now feel-good. The team could even recover after a mini-collapse — it was a thriller with the guarantee of a happy ending. “Dhoni hai na” became a soothing mantra that had the power to keep living rooms across the nation occupied till the final overs. However, one knew little of the stormy mind behind the tranquil face. Like a duck, Dhoni was paddling furiously to remain afloat at cricket’s big bad deep end. 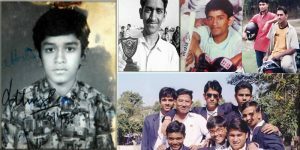 On a wintry day in early 2013, Dhoni spoke about those early days in the Indian dressing room that was dominated by a host of seniors who had their own pet juniors. It was at Yuvraj Singh’s book launch in New Delhi that Dhoni dropped his guard. There were a couple of things that have stayed in mind from that evening of anecdotes. First, Singh’s chosen term of endearment for his U-19 mate from Jharkhand was “Bihari”. Obviously, geography isn’t the only thing wrong about that nickname. says, ‘Haan haan, thoda time hone de, pressure padega phir pata chalega ke chhakke se nahi, match jeetane se zyada appraisal hota hai. (Yes, yes just wait for some time; once there’s pressure, you will realise that it’s not the sixes but victories that get you better appraisals)”, recalled Dhoni. This certainly wasn’t the kind of quote that curators look for when compiling a list of motivational-thoughts-to-inspire-freshers manuals. This was when keeping a count of camps within the Indian team was the most important statistic for a reporter on the cricket beat. It was almost a given that aligning with a star gave you extra immunity in the dog-eats-dog world. But Dhoni was no hero worshipper; he didn’t make desperate moves to fit in or be part of coteries. A natural leader, he has always been surrounded by committed mates and fair-weather hangers-on. Recall the first few reels of his biopic, and that merry gang of Mahi believers comes to mind. Those were his friends who travelled miles to get him a bat deal, be a part of samosa-chai parties when the chips were down and drove across states to ensure that he didn’t miss a game. Later in life, he had Suresh Raina, RP Singh, Robin Uthappa and Ravindra Jadeja rally around him. In his book, Chappell writes about what could be Dhoni’s lasting legacy. According to him, he “broke down one of the biggest problems in the Indian team”. It’s a breathless account of the complicated team mechanics just before Indian cricket’s biggest generational shift. “I would speak to young players individually, and they’d have great ideas. But once we were in a team meeting, they would clam up… The youngster would say, ‘I can’t speak before so-and-so. By all possible calculations and considerations, Dhoni is expected to call it a day after the World Cup next year. The compulsive leader will be a tired man with sore hands as he walks into the sunset. After close to two decades of keeping wickets, he will have crooked fingers with painful lacerations. But look out for those additional blisters that aren’t wicket-keeping wounds — they are medallions of valour for spending a lifetime holding the reins of Indian cricket ever so tightly. He made a habit of not letting it go even when it got tough. He made “Dhoni hai na” not just a stray comforting thought but a confident mindset.